Artists who name-check themselves in their own song is very common nowadays, especially in the rap genre, but it was once a fairly rare thing. Anyone who recorded Hello Dolly would have done it, The Weather Girls do it in It’s Raining Men and the Big Bopper is an early example in 1959’s Chantilly Lace, but the earliest example I can find is in the original version of the Gene Vincent hit Pistol Packin’ Mama. Vera Lynn (who has just turned 101), was the Forces sweetheart and when she sang the British troops’ spirits were lifted and she brought a smile to their faces, in America Pistol Packin’ Mama had a very similar effect. The US soldiers, by 1942, like most people, were sick of the fighting and just wanted the War to be over. Pistol Packin’ Mama was a jukebox favourite and the following year, once people saw how much joy it was bringing, others decided to cover it with popular versions by the big names of the day Bing Crosby & the Andrews Sisters and Frank Sinatra. The writing credit on the label is Albert Poindexter which is (almost) the real name of the man who recorded the original. He was born Clarence Albert Poindexter, but known as Al Dexter, in Texas in 1902 and spent his early years as a house painter but music was his first love and so he, without a lot of money he managed to afford a harmonica which he taught himself to play and then, using an old washboard, he built himself a guitar and offered his services in the local dance halls in the early thirties. A lot of what he play was gospel music, but it was only after a record company promoter told him that if he recorded gospel music it would never be a big seller that he turned to country music. He signed a deal with Vocalion records which was predominantly a jazz-genre label but between 1937 and 1939 he released 10 78rpm singles then in 1939 issued My Troubles Don’t Trouble Me No More which was now credited to Al Dexter and His Troopers. In 1941 he switched to the Okeh label, the country arm of Columbia Records and the first single being The Money You Spent Was Mine. 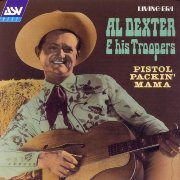 In March 1942 he wrote and recorded Pistol Packin’ Mama which was born out of a conversation Dexter was having with a waitress in a roadhouse in Turnertown, Texas. She told the story of how her boyfriend’s wife chased her through a barbed-wire fence whilst toting a gun. This interested him and he began to have thoughts of what he himself might say to such a woman yielding a gun and those thoughts he noted on a napkin were ‘Lay that pistol down, babe, lay that pistol down.’ Dexter recounted, “I said ‘I told you to leave that married man alone. That woman’s gonna kill you ’bout that man.’ She said, ‘Yeah, but Dex I love that little cross-eyed man. '” The song eventually made it on the American Billboard chart and took a very slow climb eventually reaching number one where it remained for eight weeks. The song was the epitome of the old grey whistle test, whoever heard couldn’t prevent themselves from singing or humming it. In October 1943, the New York Yankees, who had just beaten the St. Louis Cardinals at a hard-fought baseball game, celebrated in style when, in the dressing room, after the match began singing Pistol Packin’ Mama weaved in and out of Beer Barrel Polka. A few weeks later they dropped the latter and Pistol Packin’ Mama became their marching chorus. Dexter earned a reported quarter of a million dollars from that song – a lot of money in the 1940s, he said in an interview with Tony Russell, “It’s just a case of a fellow dreaming for 14 years and nothing happens, then one night he has a nightmare and it makes him a fortune.” It sold over three million copies and became one of the biggest selling tracks during the War years alongside White Christmas. Even more money came in when the song was featured in the 1943 film of the same name which tells of a woman who is cheated out of her bankroll by a gambler that rolls into town. He then opens a casino and whilst he’s on holiday she gets a job there as a singer. When he returns he tries to fire her but she then pulls a gun on him and they gamble for the club he bought with her money. Sounds exciting even if it is only just over an hour long. Like Dave Clark in the sixties, Dexter was an astute businessman and soon learned the benefits of owning his own copyright which made him a lot of money. He went on to have a country number one with Guitar Polka in 1946 but with the money rolling in he dabbled in real estate, bought a couple of nightclubs and owned his own motel in Lufkin, a city in East Texas. Dexter, who received 12 gold records for million-selling singles between 1943 and 1948, was inducted into the Nashville Songwriter’s Hall of Fame in 1971 and the Texas Country Music Hall of Fame in 2010. He died in Lewisville, Texas, in 1984.